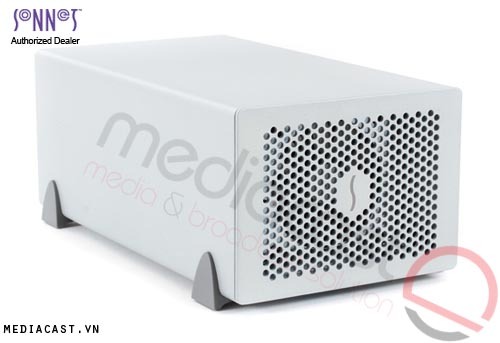 The Echo Express III-D Desktop Thunderbolt 2 Expansion Chassis from Sonnet enables you to connect three compatible full-size professional video capture, audio interface and other special-purpose cards to your iMac, Mac mini, MacBook Air, MacBook Pro or the new Mac Pro with a Thunderbolt port. 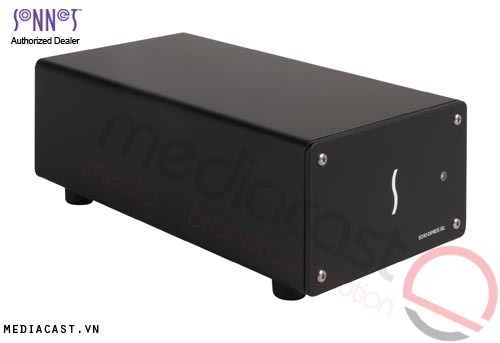 The Echo Express III-D integrates a universal 300W power supply and includes a 75W auxiliary power connector for cards that require supplementary power. The expansion chassis is eco-friendly as it automatically powers off when the connected computer is powered off or in sleep mode. The use of larger, slower-spinning fans in the Echo Express III-D reduces noise. Two Thunderbolt 2 ports support daisy chaining of up to six devices to a single port on your computer. 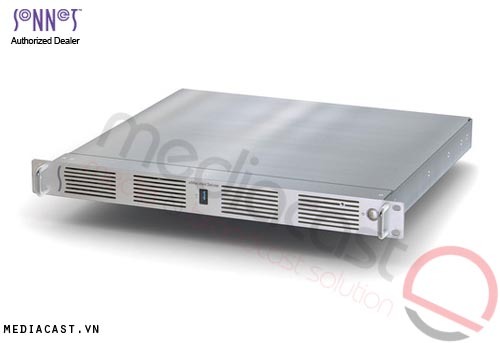 The original 10 Gb/s Thunderbolt interface has provided breakthrough bandwidth for external expansion, which is more than sufficient to support the maximum performance of most PCIe cards. However, some high-bandwidth cards such as the RED Rocket, 16 Gb Fibre Channel, multi-port 10 Gigabit Ethernet cards, or multiple bandwidth-hungry cards require more than 10 Gb/s. 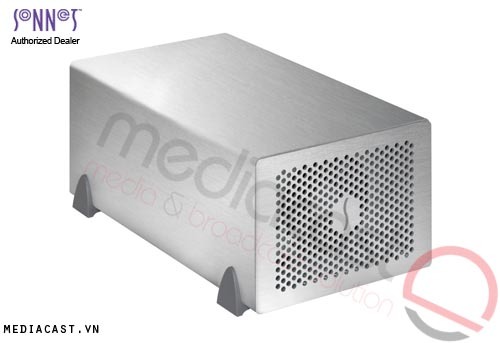 Thunderbolt 2 overcomes this barrier by providing a higher bandwidth of up to 20 Gb/s for these demanding applications. 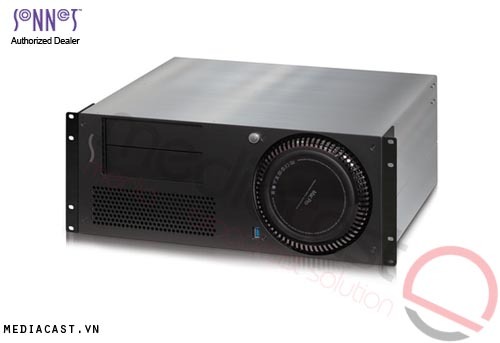 Sonnet's Echo Express III-D makes possible to use full-size professional video capture, audio interface, SAS & SATA HBA, 16Gb & 8Gb Fibre Channel, 10 Gigabit Ethernet and RAID controller PCIe cards with your Thunderbolt 2 port-equipped Mac. 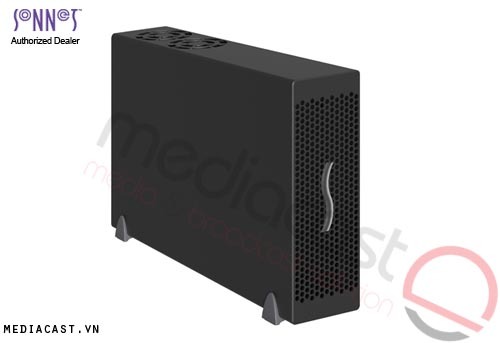 Featuring high-bandwidth Thunderbolt 2 technologies, the Echo Express chassis squeezes every bit of performance out of the most demanding PCIe cards and ensures optimum performance with every compatible computer. 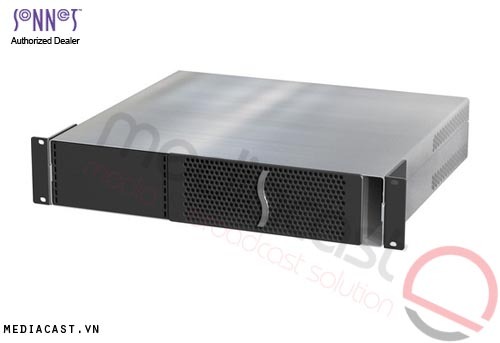 Constructed of rugged and lightweight aluminum, the outer shell of the Echo Express chassis securely protects the PCIe cards installed inside without weighing you down. 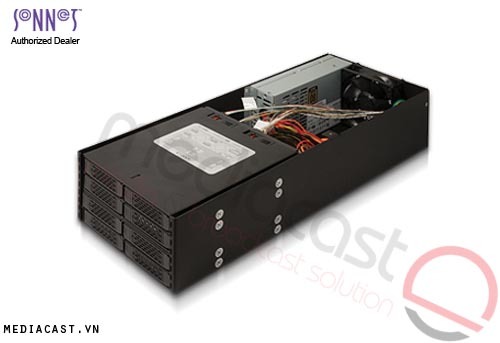 The chassis also includes an internal 300W universal power supply with a 75W auxiliary power connector and power harness cable to provide ample power for cards with high power requirements. Two large, remarkably quiet, and temperature-controlled, variable-speed fans and airflow management ensure that hot-running cards and the chassis components remain reliably cool without having to install an extra blower in one of the three slots. Because the fans automatically speed up and slow down in steps as needed, there is no guesswork in setting a switch position, and no need for tools to change settings. Echo Express products are environment-friendly, automatically powering on and off with your computer.